Alix Steel: I’m Alix Steel, and welcome to a special edition of Bloomberg Commodities Edge. It’s thirty minutes focused on the companies, physical assets and the trading behind the hottest commodities with the smartest voices in the business. Alix Steel: Our topic today is crude. 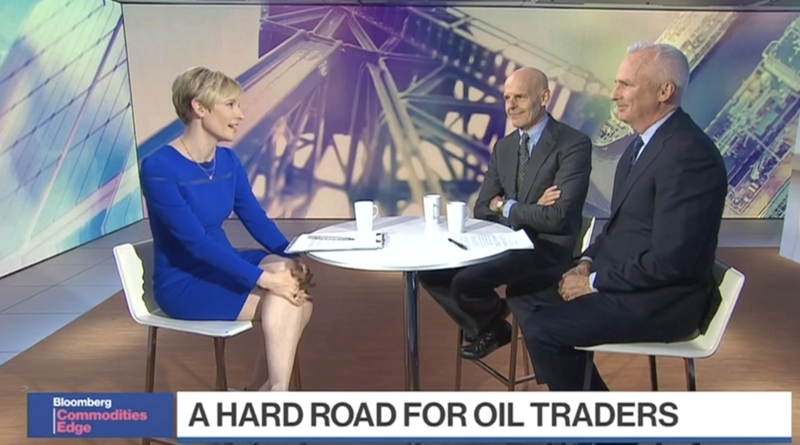 It’s gotten a lot harder for traditional market participants to trade oil, just ask one of my guests, Andy Hall. His commodity career spans over thirty years. He’s worked at Citi, BP, and Phibro before running his own hedge fund, Astenbeck Capital. He closed that flagship fund in 2017 after suffering losses and now he collects art and trades oil with his own money and is an advisory board member at Orbital Insight. Alix Steel: Orbital Insight is a solution for traditional traders by offering daily global inventory data, in real time, and Kevin O’Brien is the Chief Business Officer at Orbital Insight and also joins us here on set. Alix Steel: Guys, thanks. So great to see you. So happy that you guys are here. I still can’t believe Andy’s here in person. I didn’t believe it was going to happen. Alix Steel: So, it’s great. You have the analysis and you have the trading expertise. Let’s dive right in. The question in the market is that 1.2 million barrel a day cut from OPEC+. Is that going to make a significant difference in the market and to prices? So, Kevin, from the lens of your data, how do you know? How do you figure that out? Kevin O’Brien: Well the basic problem that we’ve seen in the market traditionally is when people talk about OPEC cuts or cuts even out of the U.S., then what is the actual aggregate number that you’re speaking about? So what we did was we went in and said, let’s map out the total storage across the entire planet. So it’s about 24, 25 thousand tanks, in the U.S., in China, in OPEC. But, when you look at OPEC, when they say what the production cut’s going to be, it’s like what’s the actual supply levels that you’re seeing in OPEC, but then distill that down to the individual contributor countries. Then you’ll start to see divergent patterns there. So, whether, if the Saudis says they’re going to cut back, then you can actually begin to monitor. Are you seeing increasing supply levels? Or are those inventories going elsewhere? Kevin O’Brien: But go outside of Saudi. What are the Iraqis doing? What are the Iranians doing? What are the other members of OPEC doing? To get a more complete picture. And I think that’s going to help folks like Andy and others in the marketplace take a better decision on what to do. Alix Steel: Andy, how would you use that kind of data? How does that help you? Andy Hall: The oil market is all about supply and demand, and if supply exceeds demand, prices ultimately are going to go down. If demand exceeds supply, prices will go up. The easiest way to determine whether supply exceeds demand or vice-versa is by looking at inventories and whether they’re rising or falling. Now, in the thirty years, or more than thirty years, that I’ve been in the business, we’ve never really had a good window on what is happening with global oil inventories. You know, we get this weekly data from the U.S. government, the EIA weekly statistics and people look at these things, scrutinize them. The fact is, they only cover the U.S., which is 20, 25 percent of the world’s oil market. And the data available for inventories elsewhere in the world is poor, at best. The IEA produces data for the OECD countries but it comes out on a monthly basis, a month or two after the event. It’s then subject to revisions. Andy Hall: For China and non-OECD countries, we have essentially no information. JODI produces data but it’s not very reliable, and it comes out also with a two-month lag. So, up until now, for 80% of the world’s oil market, we’ve basically been in the dark as to what’s happening with inventory levels. But now, Orbital Insight is producing timely, reliable global inventory data which basically gives us a window on the whole world’s oil market. Alix Steel: How’d you guys meet? Andy Hall: Back when I was running Astenbeck, we were always looking at new sources of information and, I don’t know whether I contacted Orbital Insight or they contacted me, but, it was obviously an interesting idea that you’d basically look down on the world and you could see what’s going on in real-time. Alix Steel: So, we have real-time, Kevin. What are you learning, right now? When you take a look at global inventories. What are you learning and where does the market have it wrong? Kevin O’Brien: Global inventories are building year on year. I think the market had not really thought that that was going to be actually happening. So we look at over 40 million barrel build, year on year, which the market said, “where did that come from?” We said, well, this is the methodology that we’ve been using. When you look at China, they’re an active buyer right now in terms of the lower prices of that. The U.S. is fairly steady. Then with OPEC, for example, we have a 28 million barrel build, year on year, 20 million out of that 28 have come from Iran. So, again, it goes into that distillation down to country level, you can get down to tank level quite frankly, as some traders want to do, to be able to look at, where are the draws and where are the builds. Kevin O’Brien: I think that’s the interesting thing we’ve seen in the past few months. That, going back into the fall around September, we were looking at our service just and incremental continued build and the market was saying “Oh, you’re going to have continued draws”. So there’s a big delta that’s developing here, from a latency effect. You can either trade off that quite well, or you can have quite a bit of exposure. I think we’re still seeing that type of pattern. These divergent builds versus draws in certain parts of the world. For us to be able to help people distill that down. Alix Steel: Andy, for you then, using his data and your expertise in the market, does a 1.2 million barrel a day cut for next year, do it? Andy Hall: That’s the $64,000 question. That’s just one element of the supply-demand story. Yeah, you’ve had OPEC cut by 1.2 million barrels a day, but you have other things going on as well. On the negative side, there are headwinds regarding demand. Worries of the threat of trade wars. How robust is emerging market country demand? A stronger dollar is generally not constructive for oil demand, commodity demand in general. On the other hand, not only have you had OPEC cut production, there’s no question that lower prices will have an impact on production growth here in the U.S. I think when we look at 2018 as a year, the biggest surprise has been the rapid growth in U.S. oil production. Everyone knew it was going to grow, but I don’t think many people expected it to grow by as much as it has. Right now, year over year growth in crude production here in the U.S. is about two million barrels a day. Back in January, the U.S. government’s EIA was forecasting growth of half a million barrels a day. So, you know that’s a staggering difference. But, of course, prices have now dropped 25, 30 dollars a barrel, so that will presumably have an impact on production growth here in the U.S.
Alix Steel: And we’re going to get to dig down deep in that and what your inventories tell us about that. But before we go, just to set it up, are you more Bullish or Bearish right now? Andy Hall: I think, with prices hovering around or a little over 50 dollars a barrel, I think you’d have to have a pretty negative outlook on the global economy to believe the prices will continue their downward trajectory. I don’t think we’re on the verge of a global recession or anything like that, and I think, to use that old commodity adage, price cures price. A 30% correction, or a 30% downdraft, not only is it going to impact the supply side of the equation, but demand also will respond to that kind of price movement. So I think, on balance, if you want to place a bet on oil right now, you’re probably better off betting on it going up than it going down. Alix Steel: Alright, thanks so much Andy Hall, Kevin O’Brien of Orbital Insight. They’ll be sticking with me. Orbital has received past funding from Bloomberg Beta. That’s the venture capital unit of Bloomberg LP. Alix Steel: Coming up, another big reason it’s hard to trade oil; U.S. shale. The future of production and how it impacts how you look at the market. This is Bloomberg.